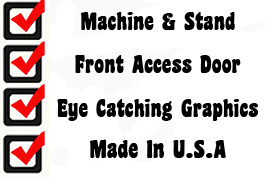 This popcorn machine includes the premium stand and has all the benefits of larger machines. This four ounce concession style machine features both a warming deck to keep your popcorn hot all day and an "old maids" tray for easy cleaning. Never before has a Paragon four ounce popcorn had all these features with such a low price. Forget the other machines with plastic sides and top. Glass panels and a pair of plexiglass doors out weight the competition for function and cleanibility.